I am an ABS Master Smith with almost forty years of knifemaking experience. Next year will mark my 27th year as a Master Smith with the American Bladesmith Society. All my knives are forged in my shop. I make the sheaths (leather wrapped wood sheaths), forge the blades, grind, heat treat, etc. I do it all and I am (pardon the brag) excellent at it. I make knives that I like. Knives that I would own and use. I will take orders and you can contact me if there is a design that appeals to you. If you are interested in one of my knives, please contact me. My other life involves being a college professor and years ago I realized that the research I engaged in and the articles I had written soon became outdated as new knowledge took its place. I had this insight back then that some of my knives would be prized and valued way beyond the time of any of my professional publications and likely even my life. A knife that I created might last centuries or even longer. An article I wrote was unlikely to be even worth a footnote in a couple of decades. There was something powerful about that comparison. Personally, I like many of the historic knives and swords. In the photos here, you can see some recent swords I have made that are an attempt to be somewhat true to known historic pieces: a recent court sword (small sword) of a colichemarde design, a 19th century British saber with a mameluke handle, and a Japanese katana. My hunting knives run between patterns of the late New England 1700s, often referred to as rifleman’s knives, to knives with reverse stag handles. I think I have modified those designs a bit to achieve a certain effect. Obviously, they are not identical to the historical pieces but you should be able to see the influence and similarity. I, like most other bladesmiths, enjoy making bowies. I also like long knives and fighters. Then on occasion, I will just make a knife because at the moment that particular design attracted my interest. My most recent interest is in a making a Damascus Pesh Kabz with a traditional T shaped blade and ivory handle. Personally, I like big knives and small hunters. 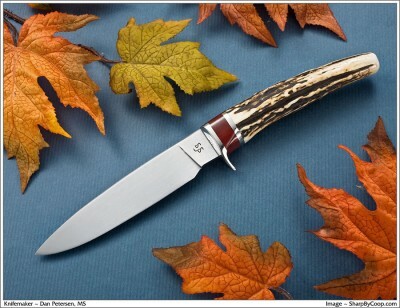 My favorite knife right now is a five inch drop point knife with a revers stag handle. The blade is very wide and if not for the stag handle it would look like a tiny chef’s knife. I take most blades I make and test them before I finish them off. That also includes the swords that I make. I expect a buyer to be able to use my knives and appreciate their ability to meet or exceed the performance of any other knife that they have ever owned. The performance of the blade is very important to me and I have gone to a great extent in time and equipment to make each blade the best that I can. Copyright © 2008 Dan Petersen. All Rights Reserved.